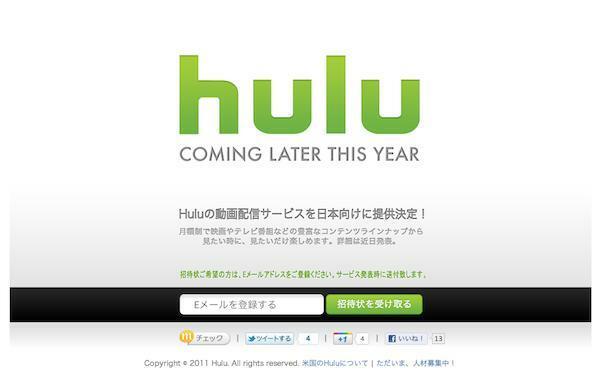 Without any warning, home video service Hulu announced that it will be expanding to Japan by the end of the year. The URL Hulu.jp is already live and serving up the page that you see above where you can sign up for updates on when it will launch. According to the report, the service will be serving up premium video on PCs, TVs, mobile phones and tablets, but no word on what exactly the content will consist of. The implication seems to be that it will mainly be Japanese produced television programs and movies, but seeing how much Anime is on the American version of the site these days, there are sure to be some shows from the side of the Pacific as well as they obviously have no issues with cross pollination. In Japan, we also see an unfulfilled market need with respect to premium feature film and TV content, and very favorable environmental factors to a service like ours, including extensive broadband penetration, smart phone and other internet-connected device ubiquity, and strong consumer interest. We have been able to use what we have learned from Hulu and Hulu Plus, in addition to the insights gleaned from our market research, to design a high value product specifically tailored for Japanese customers. Of course, we would be remiss if we did not note that Netflix has not yet announced plans for Japan officially despite a recent job posting from the leading streaming content service specifically listing “Japanese” as one of the languages they were looking for employees to be fluent in. Add in the fact that Netflix is expanding into Southern and Latin America this year, and rumors seem to indicate Europe is next, Hulu heading to Asia make a lot of sense as they could possibly beat their biggest competitor to the punch. Despite the fact that Hulu is currently up for sale, it certainly seems that a week hasn’t gone by as of late without the company finding some way to make themselves more desirable to a potential buyer. From considering a new tier of service, signing their first original production to now expanding to an international market, the company is looking like a tastier acquisition with each passing day. There are no details as of yet of what Hulu will be charging in Japan for its servie, but we imagine it will be in the same price range as Hulu Plus here in the United States, around $7.99 a month. What do you think about Hulu expanding into foreign markets?